Wisconsin officially casts its ten Electoral College votes for Barack Obama. The ten Democrats selected last October to cast Electoral College votes for the president-elect gathered at the Capitol Monday. They cast a unanimous vote for Obama and Vice-president-elect Joe Biden. Governor Jim Doyle, who was among those voting, says the vote comes after an election that provided a strong statement on who Wisconsin supported for president. Obama won 59 out Wisconsin&apos;s 72 counties in November. 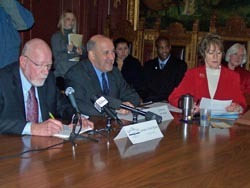 The ten electors were Governor Jim Doyle of Madison, Ray Rivera of Pleasant Prairie, Senator Fred Risser of Madison, DPW Chair Joe Wineke of Verona, Rollie Hicks of Eau Claire, Dian Palmer of Brookfield, Representative Gordon Hintz of Oshkosh, Christine Bremer-Muggli of Wausau, Donsia Strong Hill of Oneida, and Representative Annette Polly Williams of Milwaukee. Similar ceremonies took place today in states across the nation.